I am pleased to present the annual report of Mourne Heritage Trust for 2013/14. This year saw continued progress on a number of fronts. 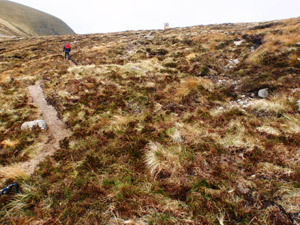 The major exercise to repair eroded sections of the path network in the high Mournes concluded with the final sections on the ‘Brandy Pad’ at Donard and Commedagh. The completion of this phase saw the investment in the path infrastructure of the AONB reach close to three quarters of a million pounds since 2010. This work has been a true example of joined-up government. 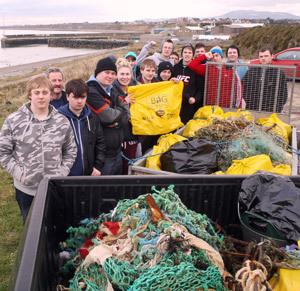 It brought together funding from Northern Ireland Environment Agency, Northern Ireland Tourist Board, Sport Northern Ireland and Heritage Lottery Fund to achieve the complementary objectives of protecting the environment and enhancing the visitor experience. On behalf of all who enjoy, work in and care for the Mournes, I would like to express our gratitude to the funders and also to the various land owners, Northern Ireland Water, National Trust and my fellow local farmers. Another significant development in visitor management has been our development of a ranger service for the world class mountain bike trails at Castlewellan and Rostrevor forests. The combined impacts of tree disease and a particularly stormy winter made the context for maintaining these quality trails very challenging and thanks are due to our partners in Down and Newry and Mourne District Councils and Outdoor Recreation NI and to the landowners, Forest Service, for their cooperation and assistance. We have continued to work to address threats to, and where possible to enhance, priority habitats and species of the Mourne AONB. A particular focus has been on working closely with Northern Ireland Fire & Rescue Service to learn about and adapt best practice in wildfire prevention from across Europe to devise approaches that can be effective in our particular context. Among other biodiversity enhancement actions we have continued our research into heathland regeneration techniques with a view to trialing specific approaches and further developed our propagation of the genetically distinct Mourne Juniper. I am pleased also to note the successes achieved in the first full year of operation of both the Mourne Mountains Landscape Partnership, our £3m plus programme of actions to ‘re-connect’ people with the special landscape qualities of the High Mournes, and also of the Mourne Cooley Gullion Geo-tourism programme, led by Newry & Mourne District Council and in which the Trust has a key role providing expert input and guidance to the project team. Alongside other achievements, these projects have built on the work of our Active Lifestyles programme in adding to the huge volunteer effort that goes into caring for Mourne and for which I wish to thank all who give freely of their time, not least my fellow Mourne Heritage Trust Board members. 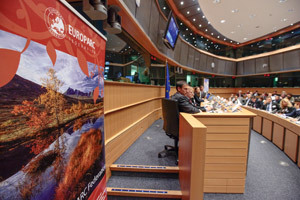 For the second year in a row the Trust received commendation of its work from Europe, recognised by the EUROPARC Federation in a ceremony at the European Parliament in Brussels for an outstanding contribution to the promotion of sustainable tourism. I congratulate both the Trust’s staff and the tourism enterprises who work with them and who very much share in the credit for this award. The year past saw the Minister for the Environment announce that he would not at this time be taking forward enabling legislation for national parks in Northern Ireland. I was encouraged to hear that he would continue to seek other opportunities to promote and protect our wonderful landscapes and historic buildings for the enjoyment and benefit of visitors and locals alike. This, of course, is exactly what Mourne Heritage Trust has endeavoured to do for the best part of two decades and I look forward to engaging with policy makers to consider how both the inherent qualities and vast potential of our wonderful landscape can be safeguarded and sustainably developed. A key concern for Mourne Heritage Trust in particular is how management services that are themselves sustainable and fit for purpose in the 21st century can be supported. 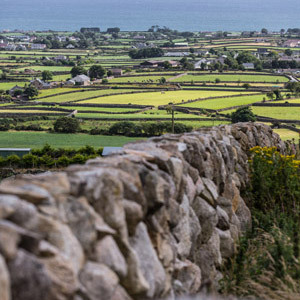 Looking ahead, the implementation of new local government arrangements in 2015 will for the first time place the entirety of the Mourne AONB in one local authority area. I believe this provides an immediate opportunity to improve the stability and consistency of the environmental and visitor management services provided and I look forward to building a strong working relationship with the new Council to this end. I would like to acknowledge the support and cooperation received over the 17 years of Mourne Heritage Trust’s existence of Down and Newry & Mourne District Councils, whom we will continue to work with in their new guise, and also of Banbridge District Council, to which we will say farewell as a formal partner when it combines to form the Armagh-Banbridge-Craigavon entity. We do hope however to continue to work with the wider Banbridge area and its Council as a key gateway to Mourne. Finally, my thanks to our other main funders and founding partners, Northern Ireland Environment Agency and Northern Ireland Tourist Board, to the various project funders listed in this report and to the many other organisations and individuals who have contributed to the achievements outlined. The Board of Trustees represents a partnership of interests which includes local elected representatives, landowners, farming and community interests. The Board gives a strategic lead to the management of the AONB. The Board met collectively on seven occasions through the year, while members also contributed through the Executive Committee, Natural Heritage Sub Group, Destination Mourne Mountains and Ring of Gullion Tourism Forum and Mourne Outdoor Recreation Forum among other mechanisms. There was one change to Board membership in the course of the 2013/14 year. 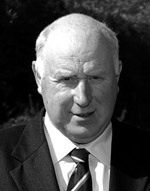 Councillor Connaire McGreevy stepped down as a Newry & Mourne District Council representative in December 2013 and was replaced by Councillor Brian Quinn. Board membership at 31st March 2014. The Mourne Heritage Trust held its sixteenth Annual General Meeting on Wednesday 2nd October 2013 at Tollymore National Outdoor Centre, Bryansford. The meeting was opened by Chair of Down District Council Maria McCarthy, with closing remarks by Ms Margaret Ritchie MP. After thirteen years of loyal and valuable service Mr Dave Keown retired from his post as full time Countryside Officer, but has continued to provide his experience and expertise to the Trust on a part-time causal basis. At intervals through the year the Trust employed Mr Philip Savage, Mr Martin Sharvin and Mr Eddie Clarke as temporary upland path repair officers. Mr Savage also acted as temporary seasonal Countryside Officer along with Mr Kieran Burden. Mrs Rosemary McVerry resigned her post as Administrative Assistant after nine years to look after her young family. Mrs Niamh Valentine was appointed to the vacated post in October 2013. Mr Keith Mackey was appointed as Mountain Bike Ranger in May 2013. A key element of the Trust’s functions across all the work areas outlined in this report is informing public policy and programmes. This is to ensure that the needs of the Mourne AONB are appropriately considered. Where relevant policy inputs this year are included in the summary highlights of each section of this report. The Management Plan was developed in 2010 through review of relevant research to provide a sound evidence base and extensive consultation with local people and other stakeholders to provide further insights and build consensus. The plan is relevant to anyone whose activity or decisions affect the Mourne AONB and not just a plan for Mourne Heritage Trust. Therefore, while it is a non-statutory document, the successful implementation of the Management Plan draws on the commitment of various agencies and local stakeholders to pursue these principles in line with their abilities, priorities and resources. For each of these particular aspects of our landscape theme the plan outlines the special qualities of the area and sets out what broad approaches are seen as appropriate to maintain and enhance those attributes. The Action Plan goes on to set out specific actions to give effect to these approaches. At this point last year the greatest year-to-year change in percentage of projects by category was the reduction of 7% in the red category. This year, the greatest change has been the increase by 5% of actions on or ahead of schedule (the green category). This rate of increase at this point in the action plan period, entering the final third, is encouraging and leaves only a small percentage of actions remaining in the red category. With 21 months from the date at which the progress above was measured until the end of the action plan period in 2015, we are hopeful of reducing this percentage further. With major projects still ongoing like the Mourne Mountains Landscape Partnership and Mourne Cooley Gullion Geotourism - running to 2016 and 2015 respectively - we expect that the greatest shift in the remaining period will be in the orange to green categories. The timescale for the current plan runs to the end of the 2015 calendar year. In 2014 we will review progress with partners and proceed to consultations with key stakeholders with a view to identifying priority needs and actions for a revised management plan. In addition to coordinating and monitoring implementation of the Management Plan, the Trust’s role is also to provide direct landscape management services and to develop and deliver relevant projects. In the remainder of this annual report we focus on the subset of management plan activities undertaken directly and/or led by Mourne Heritage Trust. In order to make best use of limited resources we have continued to target our protection and enhancement efforts on a number of priority species and habitats identified in the Mourne Biodiversity Action Plan. The Northern Ireland Environment Link/ Northern Ireland Environment Agency NGO Challenge Fund enabled us to develop our Red Squirrel project with specialist equipment to control invasive grey squirrels and encourage red squirrels at Silent Valley and Mourne Park. The funding also provided for a best practice study visit to Anglesey, Wales with partners undertaking similar work in Northern Ireland. Discussions are underway about translocation of red squirrels from sites such as the Glens of Antrim and the Ring of Gullion to the Mournes. The individual award in our annual Natural Heritage Awards this year went to volunteer John Francis Smyth for his sterling Red Squirrel conservation work. 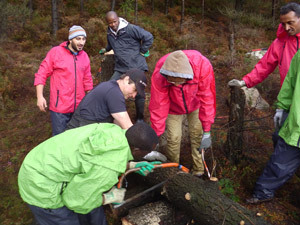 Funds from the NGO Challenge Fund were also obtained to develop post fire habitat restoration techniques at Happy Valley wood, where 10 hectares had been decimated by wildfire in 2011. Forest Service is managing contractors to clear the burnt wood, after which MHT will work with volunteers to restore a semi natural heathland and copse habitat. Site boundaries and access routes were refurbished to facilitate this work. The way forward for design of experimental heathland recovery plots in the Eastern Mournes Special Area of Conservation was enlightened by a best practice literature review commissioned from Quercus, a part of Queen’s University Belfast responsible for conducting high quality ecological research within the School of Biological Sciences. While this was being completed we continued to carry out trial seeding of eroded areas and to survey heathland management exclusion zones. Our Trees for Mourne programme planted another 20 acres of provenance woodland in the including at Leitrim Hill, near Silent Valley, from where a feature was broadcast on BBC ‘Good Morning Ulster’ in March 2014. Encouraging progress was made in our Juniper Restoration Programme. Firstly, additional plants not previously logged were located in the mountains by our Volunteer Rangers. 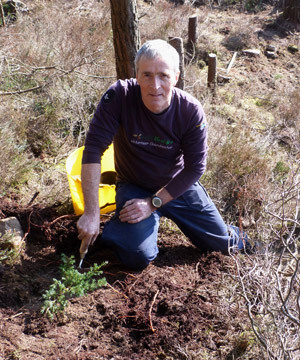 Moreover, the first batch of the genetically distinct and threatened Mourne juniper plants, grown from propagation of seed at Cheviot Trees, Berwick on Tweed was planted out in March 2014 at the Silent Valley nature trail. There was also continued success in propagating cuttings in our own nursery and these are now ready for planting in suitable upland locations. The various processes require to obtain landowner and statutory agency permissions were well advanced. 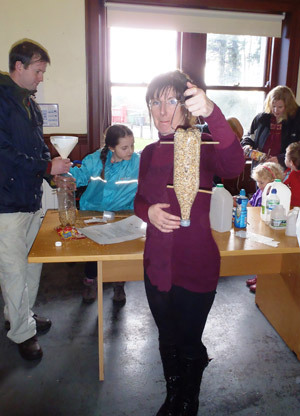 In conjunction with Mourne Nature Watch and the ‘Action for Biodiversity’ Interreg project, we provided a programme of biodiversity training events and the development of biodiversity recording skills. 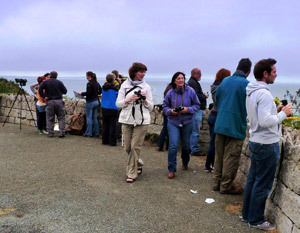 These have included: ‘Raptors of Co. Down’ presentation; heathland vegetation identification and survey training; ‘Dawn Chorus’ and bird identification; ‘Build a Bird Feeder’ workshop; beach cleans; coastal flora walks; butterfly survey and identification; and whale watches. A review of our Active Lifestyles project showed that in the current decade - i.e. the 4 years to March 2014) - no less than 2300 people have volunteered with the Trust, of whom 536 came from various disadvantaged groups. One of our main achievements this year has been building links, through Mediation NI, with the AMAL group, a community organisation for people from the Darfur Region of Sudan now living in Northern Ireland. This has led to a close partnership with members of this community involved in our conservation activities on a regular basis including path repair, heathland management and litter lifting. We aim to develop informal twinning with a mountain range in Darfur, the Marrah Mountains, to highlight the global aspect of landscape and conservation volunteering, which will help further our ties with AMAL and provide an additional focus to develop social tolerance and inclusion with other volunteers and local people. Other partners we have engaged with this year are Youth Action and Belfast Activity Centre who brought on board groups from The Prince’s Trust and Headways respectively. 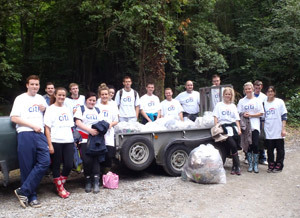 There was a significant increase in Business in the Community activity with multiple large groups of volunteers coming from CITI Group and Lloyds PLC among others. Of course, as well as developing new relationships, we also continue to value and foster our longstanding links. As evidence of this, the group award in our annual Mourne Natural Heritage Awards was presented jointly to three day care centres, Mourne Stimulus, Autism Initiatives and Mountview House, for their long term commitment over 6 years to helping manage the tree nurseries and gardens. Volunteers from a variety of our groups were involved in a number of national initiatives including the Big Spring Clean, Marine Survey UK and UK Butterfly Wider Countryside Survey. But for many the highlight of the year was when our apiary based at Dunnywater tree nursery provided its first harvest during the summer with 50 pounds of honey produced, and orders are already in for 2014! The Trust continued to develop approaches that could minimise the risk, incidence and extent of wildfires in the Mournes, including undertaking preliminary actions recommended in the Eastern Mournes Wildfire Report 2013. 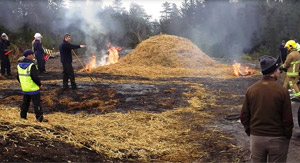 Staff members engaged in identifying best practice, including trips to Catalonia for training and conference events, hosting experts from overseas in the Mourne area, running demonstration controlled burns with partners, and working to establish a Mourne Wildfire Group, which is scheduled to begin work in Autumn 2014. 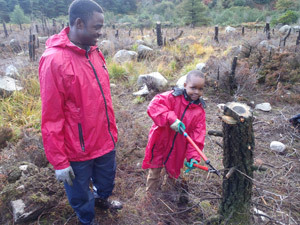 A wildfire training site was established at Silent Valley in partnership with Northern Ireland Water (NIW). Specialist equipment was acquired including drip torches, pumps, hand tools, and personal protective equipment and employed on the site in two wildfire demonstration days undertaken with Northern Ireland Fire & Rescue Services (NIFRS) and drawing attendees from across the province. The Trust also partnered with NIFRS to facilitate a 2 day wildfire awareness workshop for government bodies and NGOs. This event included a presentation on the Eastern Mournes Wildfire Report which established support and buy in from relevant policy makers for a Mournes Wildfire Project to act as a pathfinder project for Northern Ireland. We also worked closely with NIFRS and NIEA in monitoring wildfires and in developing prescribed burn plans for key control sites recommended in the Eastern Mournes Wildfire Report, initially on NIW land. A valuable partnership was also established with King’s College, London, and wildfire computer modelling, heathland fire analysis, student research and academic papers are some of the planned initiatives that will inform our future activity. Active Lifestyles Programme and Conservation Volunteers providing 1537 work days (an increase of 173 days on the previous year) for all volunteers, including people with special needs. This equates to a contribution of approximately £76,850 value of labour to AONB management. Species and habitat identification and monitoring events including birds, butterflies and coastal and marine flora and fauna. Best practice literature review on heathland recovery and management techniques commissioned and further work to identify suitable experimental plots in the high Mournes. Input to First Flight Wind consultation process on offshore wind including attendance at 3 sub-groups: landscape; tourism and economy; and coastal and marine biodiversity. Autumn 2013 saw the completion of erosion control path works on the Brandy Pad at the saddle of Slieve Donard. This represented the final phase of a project designed to protect sensitive habitats and help ensure that outdoor recreation use is environmentally sustainable. 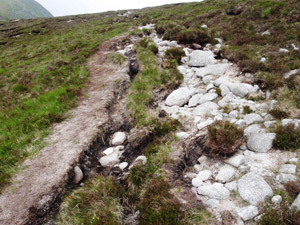 Cumulatively, it involved repair of over 6.24 km of heavily eroded paths in the high Mournes by skilled contractors working to a detailed specification prepared by the Trust. Complementing this were heathland reinstatement works by the Trust’s countryside staff and volunteers to minimise adverse impacts on sensitive habitats and visual amenity. Path repair works on this scale were very much a first for the Mourne AONB, and indeed perhaps Northern Ireland. 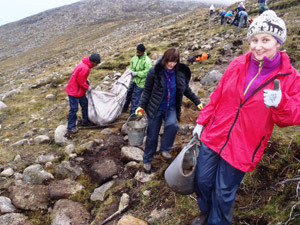 The Trust adapted best practice techniques to the particular conditions of the Mournes, assisted greatly by observations from user groups and representative bodies like Mountaineering Ireland and the Ulster Federation of Rambling Clubs. 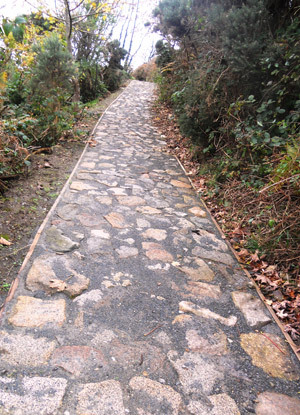 The approach developed sought to ensure that repaired paths blended into the environment whilst maintaining the challenging and rewarding experience of walking in the mountains. Feedback to date has been very positive in regard to the achievement of these goals. The very considerable body of learning gained about erosion control techniques has been shared by the Trust with other upland areas. Having reversed the cumulative impacts of many years of erosion at the worst affected sites, the focus now for the Trust is both to safeguard these sites and to seek to ‘nip in the bud’ damage and enhance resilience at other sensitive sites and routes before they deteriorate to the extent that further major capital investment is needed. Our preferred approach to achieve this is to enhance the Trust’s capacity to undertake ‘stitch in time’ preventative works through a dedicated path team deploying on a consistent basis the advanced path repair techniques and knowledge we now hold. Development of such capacity is among the recommendations of the Mournes & Slieve Croob Strategic Path Review (2012). Since completion of this study we have been engaging with stakeholders to develop awareness of the review and the Mourne Outdoor Recreation Forum agreed to set establish a working group to further consider the recommendations and establish an agreed action plan. Our Ranger service continues to address in a number of ways visitor impact at honey pot sites. 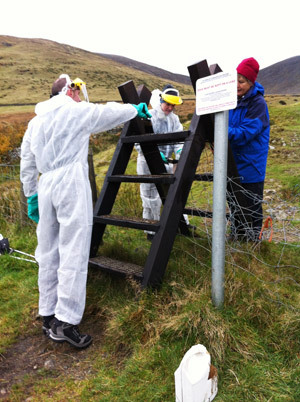 The Access Ranger carried out regular high season monitoring at weekends and bank holidays at sites including Happy Valley, Trassey and Bloody Bridge, engaging with users to raise awareness of issues like wildfire, litter and damage to walls and fences. In conjunction with Sport NI, we engaged with the Duke of Edinburgh Scheme NI to agree actions to militate against badly managed wild camping through an awareness campaign and identifying potential sites/landowners to provide managed wild camping. The Rangers worked with farmers and landowners to address problems for control of grazing animals arising from damage to fences and boundary features. 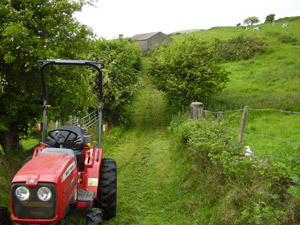 This included development of proposals to address stock control issues at Carricklittle Black Gate by installing a kissing gate, which will be implemented subject to approval from NIEA Built Heritage. 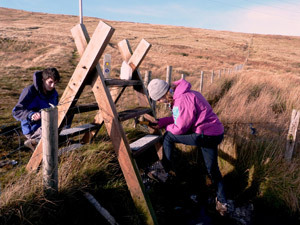 The Countryside Team then assisted the Rangers in carrying out significant fencing to the Moat Pad walking route, upgrade works along Mourne Way at Rocky River and ad hoc repairs to key access corridors- undertaken along with landowners - at locations including Browne Knowe, Carricklittle track and Bloody Bridge. Complementing this effort a dedicated ‘Stich in Time’ path team was employed from January to March ’14 through additional funding provided by NIEA from ‘Carrier Bag Levy’ revenue. This team helped keep in check wash out of paths on key sites including Glen River and Percy Bysshe and addressed issues on Binnian responding to user feedback. 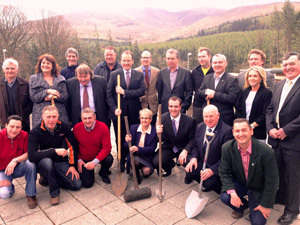 In the past year the Trust’s service to Down & Newry and Mourne District Councils was expanded to provide management services for the two new, world class mountain bike trail centres at Castlewellan and Rostrevor, opened in May 2014. A Mountain Bike Ranger, Keith Mackey, was appointed to provide this function, with guidance and support from the MHT Ranger and Countryside teams. The challenge of establishing the service at short notice was heightened by the need, a month after opening, for closure of sections of the Castlewellan Trails to facilitate the removal of diseased trees. Liaison with Forest Service and planning of diversions combined with user engagement and practical site management to ensure the optimum use of trails during felling operations. No sooner had this challenge been surmounted than a particularly stormy winter and early spring necessitated significant clearance of wind-blown trees at both sites, while the opening up of informal desire lines alongside the trails in Rostrevor presented a significant management intervention need. Developing management processes began with clarifying the trail inspection regime and establishing auditable ranger logs and reporting systems. The Trust’s Countryside Services Manager played a key role with Emergency Services, District Councils and Outdoor Recreation NI in developing an Emergency Services Plan and undertaking practical exercises. Alongside day to day trail management and user engagement, development of Event Management Procedures and organising formal event assessment was important. The Trust provided practical assistance to some very successful large scale events at Rostrevor including the Red Bull Fox Hunt and World Police and Fire Games, ensuring trail changes were properly considered and post event remediation works were carried out. Feedback from trail users and partner agencies has affirmed that the service operated very effectively in the circumstances, while also indicating that additional resources are required to implement the management approaches successfully developed in the course of the year. Armed with this knowledge, we have worked with the Councils to provide additional personnel on a part time basis for the incoming year. We have continued to monitor the impacts of outdoor recreation in the AONB. Our new electronic counter arrangements at 4 strategic access points - Glen Fofanny Bridge, Carricklittle, Ott, Trassey - produced very complete and robust data and, late in the year, we also installed a new counter on the Glen River track to Slieve Donard. This data has been used in the event monitoring initiative and other access development planning and has been provided to other agencies, being used for example by Outdoor Recreation NI to inform the Mourne Outdoor Recreation Strategy. We have also assisted District Councils on visitor monitoring arrangements at Mourne Coastal Route sites and on Saint Patrick’s Trail. Observation and user engagement were used as monitoring tools at the upland path trails and access corridor improvements outlined above. For example, times of high rainfall proved useful in evidencing potential vulnerabilities and points of weakness. This helped direct aftercare to ensure that modifications were made in good time and ensure that the substantial capital investment was safeguarded. The Trust committed significant staff and volunteer time this year to monitoring ten high profile outdoor events during summer 2013 to help profile and develop best practice under the Outdoor Event Planning Initiative. 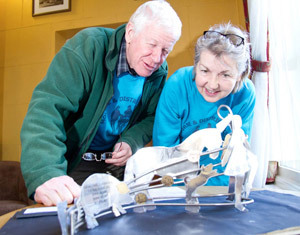 Events catered for numbers of people from 40 to 700, producing a total of almost 2500 participants, and were run on both formal national routes (Mourne Way) and open mountain areas. By and large the events were found to have demonstrated good practice. The dry summer weather contributed to minimising erosion issues, while litter management and briefing of participants was good. Establishing an agreed position on appropriate way-marking and engaging with unregulated events were identified as areas for further work with stakeholders. The Trust presented the findings of the exercise at an Outdoor Recreation NI/Sport NI organised Event Management Workshop in Autumn 2013 that was aimed at charities and clubs. There is evidence that a wider range of groups is engaging in the Outdoor Events Planning process, with several organisers engaging with MHT for the first time in the early months of 2014. 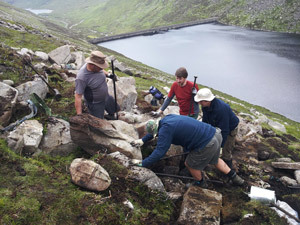 Mourne Volunteer Path Team making great headway at Binnian link path at Ben Crom. Issuing of Coaching and Guiding Permits, facilitation of large scale mountain bike events and post event remediation works. Last year we showcased the achievements of the Mournes Signature Project, initiated by Northern Ireland Tourist Board and developed and coordinated by Mourne Heritage Trust, between 2008 and 2013. The various projects combined to provide a step change in the quality and variety of the visitor infrastructure of the Mourne AONB. In 2013/14 we built on this foundation and provided further opportunities for people to appreciate and enjoy different aspects of the special qualities of the Mourne AONB. In doing so, we have had regard to the experiential tourism pillars developed by NITB and to the remaining gaps in the visitor offering identified in the Mourne Mountains Destination Plan. The experiential approach recognises that visitors increasingly do not simply want to see things but want to be engaged; they want to immerse themselves in the places they visit and to be touched by the stories of the people. Much of the Mourne area’s potential to deliver distinctive experiences and tell stories is, we feel, bound up with our distinctive landscape and related heritage. Much of our work this year concentrated on how experiences can be derived from new tourism infrastructure, notably through providing focal points for people to linger, explore and learn. 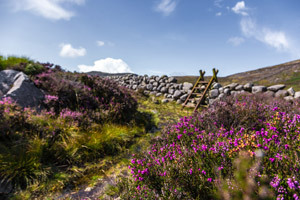 Bloody Bridge Amenity site was upgraded as a major hub on the Mourne Coastal Driving Route to incorporate the feature entrance signs and high quality site furniture of the Mourne brand, which is inspired by the stone walls and iconic heather heathland synonymous with the area. We were also pleased to complete the upgrade of the adjacent Mourne Coastal Path, owned by the National Trust and providing stunning views of the rocky coast on its journey to William’s Harbour. 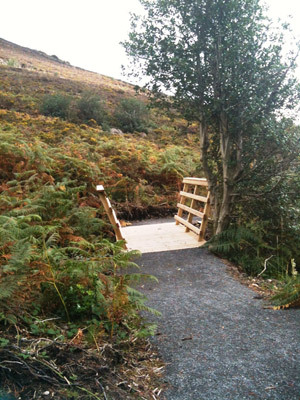 New walking routes at Silent Valley Mountain Park were also completed. 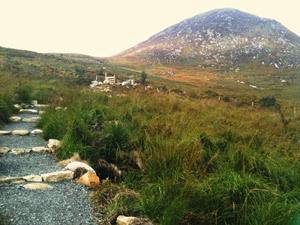 Developed to the high standards we have employed in the high Mournes, these trails and associated trailheads and way marking provide a natural flow for visitors around the Silent Valley and enable exploration of the whole park, giving a ‘wilderness’ experience to those unable to venture into more rugged terrain. Other developments reported in more detail elsewhere in this report have also provided, or soon will provide, focal points for exploration of the Mourne AONB, both physically and through the imagination. These include the completion of the upland path network repair programme and the significant progress towards the provision of a Mourne Granite interpretive centre in Annalong Cornmill, a Narnia Trail in Rostrevor and renovation and interpretation of other aspects of our built heritage. 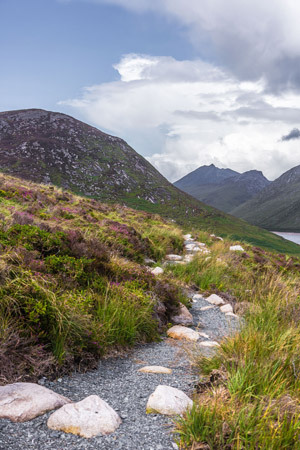 Funding was drawn down from the NIEL Challenge Fund to provide Mourne Mountains Destination Brand panels and associated literature on the soon-to-be extended Granite Trail in the mountains above Newcastle. Our work with the Mourne Mountain Bike Trails (see Visitor Management and Visitor Services) has helped to ensure a high quality visitor experience at these locations, as well as facilitating major national and international events. Scoping and pre-development work was also undertaken at other key focal points where aspects of our basic visitor access infrastructure remain underdeveloped compared with the standards we aspire to for the area. The focus for this year was on an extensive audit of upland amenity sites to identify and document deficiencies in current provision and build outline plans for enhancement with a view to targeting future capital funds. The seven pieces of public art installed through the Signature Project at locations across the AONB have proved to be real attention grabbers. We were therefore pleased this year to complete most of the planning and commissioning work for a further phase of three pieces. Production and installation of pieces only proceeds after a complex and exhaustive procurement process, including two stages of assessment of artistic submissions and various forms of consultation with local communities and stakeholders. By year end, these processes had been successfully concluded and production well advanced. 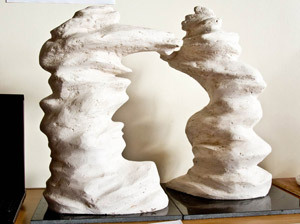 A piece for Banbridge invokes the River Bann which rises in the high Mournes and flows through the town, a historic gateway to the Mourne area. The sculpture to be installed at Bloody Bridge creatively combines both the rocky shore and fascinating geology at that location and some of the cultural heritage associated with the smuggling of illicit contraband in bygone days. A final piece, for Castlewellan, is inspired by its history as a centre for markets and hiring fairs and also celebrates the strong musical tradition in the town. In anticipation of the completion of this phase three of public art in 2014, we also gathered material for a suite of interpretive resources to establish a Public Art Trail as a key part of the Mourne experience. 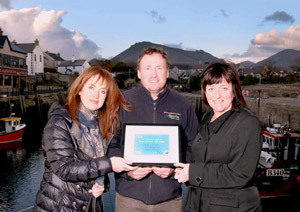 In November 2013, Mourne Heritage Trust was among a small number of individuals and organisations recognised by the EUROPARC Federation, celebrating 40 years of ‘Working for Nature’ for outstanding contributions to the promotion of sustainable tourism. The once only awards, entitled ‘People, Place, Passion’, were presented in front of 70 attendees from 12 countries at the European Parliament in Brussels. Guests to the ceremony included Members of the European Parliament (MEPs), the Minister for the Environment and Agriculture of the Marche Region in Italy and the European Commission’s Heads of both Tourism Policy and Nature units respectviely. The Trust’s accolade was in the ‘Organisation’ category and the citation praised it for ‘encouraging community participation in the promotion of conservation and sustainable development in line with the European Charter for Sustainable Tourism’. 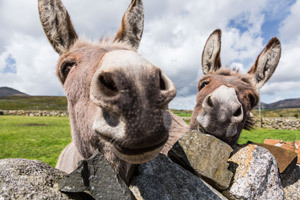 Other awards went to Catalonia and Andalucia in Spain, the Cévennes and the Massif Central in France and Italy’s Federation of National Parks. 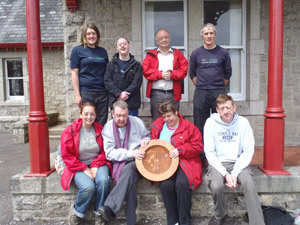 For the Trust to receive this this award from peers across Europe among such a select group was a significant honour and recognises the Trust’s early adoption of the Charter for Sustainable Tourism in 2003 and its subsequent work to develop opportunities for tourism while managing any adverse impacts on the environment and heritage of the area. Potential projects include a green tourism accreditation programme for tourism businesses, to which the Trust provided expertise from its experiences of the EU Charter for Sustainable Tourism to help develop a successful funding application. The Trust also provided input to various scoping studies for visitor developments in and around the Mourne forests and to funding applications to European fisheries funding for walking route and visitor infrastructure developments around the fishing villages of Annalong and Kilkeel. Other support included input to the SportNi led steering group convened to oversee the hosting of the Nature & Sport Euro’Meet international outdoor activities conference in 2015 (see http://www.nature-sports.eu/page.cfm?docid=euromeet-2015) and to meetings of the Mourne and Ring of Gullion Destination Forum. The latter was complemented by provision of further specific heritage and outdoor activity related content to complete the new suite of visitor servicing materials for the wider destination and specific targeted pieces including a coach drivers’ handbook for the Mourne Coastal Route. We have also supported NITB with expert input to development of policy initiatives – including green tourism guidance and the Living Legends experiential theme - as well as to relevant government policy consultations, such as the tourism aspects of the NI Rural Development Programme. 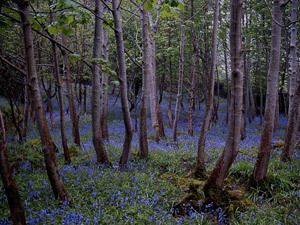 Finally, the upgrade and renewal of www.mournelive.com – our website for the Mourne AONB - fulfils an import function complementing www.visitmournemountains.com by providing information to cater for the growing niche audience of nature and heritage based tourism. 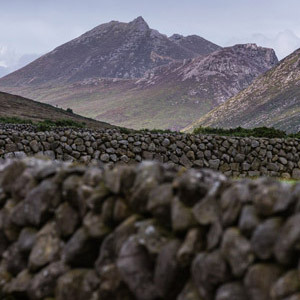 Provision of natural and cultural heritage content to Destination Mourne Mountains Visitor Servicing Materials including Visitor Map, Cycle Routes and Events Guide. 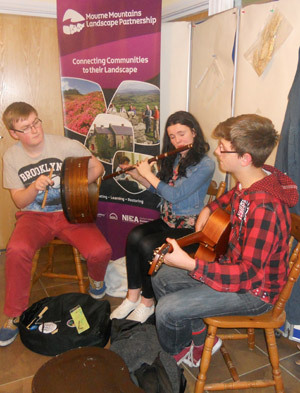 Alongside the conservation volunteering featured elsewhere in this report, a key mechanism for engaging people with their heritage – including built and cultural as well as natural – is our Mourne Mountains Landscape Partnership (MMLP). Volunteer input has come in many shapes and forms but, regardless of its nature, it is vital to the success of the Landscape Partnership Programme. 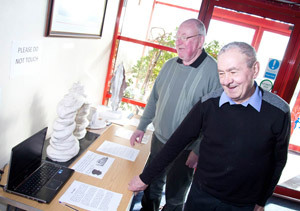 Some participants have undertaken survey work, others provided images and information to help interpret the area, while some organised landscape related heritage events. This input not only engages the community and fosters an interest in the heritage of the Mourne Mountains but also helps to establish a legacy beyond the lifetime of the project. Heritage Lottery Fund’s Landscape Partnership programme is for schemes led by collectives of local, regional and national interests which aim to conserve and enhance some of the UK’s most outstanding and treasured landscapes. The programme aligns significantly with the UK’s commitment to implementation of the European Landscape Convention and is considered one part of a wider ambition to improve the landscape’s management and help people connect with it. HLF recognises that landscape conservation is a long-term process and whilst the funding can help support a period of more intense activity, it should also lead to continued activity and a lasting legacy. The Landscape Conservation Action Plan combines ‘capital’ elements i.e. practical built and natural heritage conservation, with ‘soft’ community engagement activities. The greater balance of activity in 2013/14 was around some priority capital projects, many in receipt of EU Rural Development Programme funds, which act as catalysts for further work on heritage skills, education, interpretation and heritage celebration. The first of the capital projects under the MMLP ‘umbrella’ to cross the finish line was Phase II of the Silent Valley Visitor Infrastructure Development Plan, which brings to six the number of waymarked trails in this location that is central to the story of Mourne water. The installation of new trail heads will encourage visitors to explore the mountain park more extensively, while learning a little bit more about the heritage of the site. The Erosion Control / Upland Path project, described in detail elsewhere in this report, also completed this year, albeit somewhat later than expected as the uplands were inaccessible even in late Spring due to the unseasonal deep snow and icy conditions. Preparation work, including detailed specification, statutory consents and procurement was also brought to an advanced stage during the year for the restoration of the Mourne Wall Summit Towers; Tollymore Forest Park Follies and Monuments; Granite Trail and Narnia and Cloughmore Trails. Restoration of Annalong Cornmill, a Grade B Listed Building, was identified at the outset as a flagship project for the Landscape Partnership programme and was reaching completion by the year end. The works respect the character of the original building in terms of design, materials and methods while providing for some adaptation to facilitate sustainable use as an interpretive centre and office space. Repair and restoration of the external fabric included stone repairs and repointing; re-roofing with Bangor Blue Slates; removal and reinstatement of copings to gables and associated leadwork. Internally the adaptions provide for comfortable visitor access to some attractive spaces as well as the workings of the mill. Plans for an innovative interpretation programme to bring these spaces to life were well underway by year end. This interpretation will focus on the story of Mourne Granite and the role that Annalong Harbour played in the industrial heritage of the area as well as on the Cornmill itself. 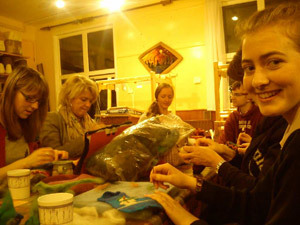 In terms of early ‘softer’ actions storytelling nights over the autumn and winter proved popular as did Hearthside Heritage Training classes which revived traditional handicraft skills. 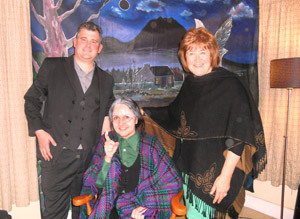 Preparatory work included appointments of delivery agents for a range of music, drama and visual arts activities through which people will be able express their appreciation of landscape. In addition to addressing the local themes identified in our Landscape Conservation Action Plan (outlined above) our actions are designed to address the four universal programme aims set by Heritage Lottery Fund. We have summarised the key achievements of the last year against these programmes and provided a brief explanation of what each one is designed to achieve. This programme provides for practical conservation actions to enhance the condition of key aspects of our upland natural heritage, to alleviate the legacy of factors like erosion and to restore the fabric of important features of the built heritage of the Mournes. 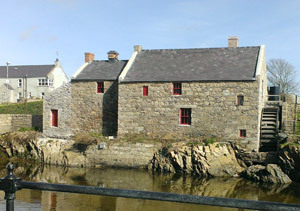 Restoration of the Annalong Cornmill was nearing completion by the year end. This programme aims to create participative opportunities for communities to reunite people with the landscape and traditions through a variety of mediums. Design experts, Tandem, were appointed to deliver a comprehensive interpretation programme for the exhibition in Annalong Cornmill. 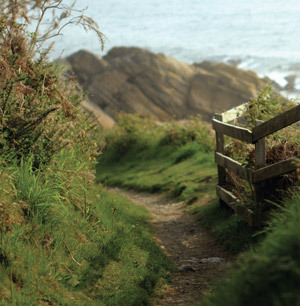 This programme aims to improve access in the physical and intellectual sense – the creation or enhancement of “trails with tales” will raise awareness of the heritage of the area as well as providing scenic walking trails for locals and visitors alike. Phase 2 of the Silent Valley development plan was delivered including completion of 3 x new way-marked trails and 2 x trail heads. Preparation work was undertaken for training programmes in a number of other heritage skills including dry stone walling, storytelling and wildlife gardening. In the last year the Trust moved its annual report online for the first time, with the detailed overview of our 2012/13 year at www.caringformourne.com complemented by a summary version on a set of attractive postcards. This approach was very well received and hence has been repeated this year. I the last year we were also delighted to complete, courtesy of additional funding from Northern Ireland Environment Agency, a long overdue revamp of our main website - www.mournelive.com . The website is designed both to celebrate the outstanding landscape of for the Mourne Area of Outstanding Natural Beauty (AONB) and to showcase the work of Mourne Heritage Trust. With a design using a bright colour palate, that changes with the changing colours of the season in Mourne, the home page is designed around three prominent ‘buttons’ that take visitors to a wealth of information on, respectively, the Landscape, Biodiversity and Built & Cultural Heritage. An About section has information on the AONB designation and the work we do to care for and Information is provided on how to contribute through volunteering and or donations. A Living and Learning area provides resources aimed at local people and students of all ages. Interactive elements include a gallery - with both stunning photographs of our landscapes and seascapes and 360 degree panoramic films – and an interactive map. And of course there are news updates, publications and much more.